A pair of Jackdaws, snuggling up in the lee of next door's chimney stack...a bit warmer than their usual perch on the wires by the telephone pole!! We planned an hour on the velodrome in Glasgow today...ho hum,they are preparing for a race meeting (Revolution) this weekend...so us ordinary bods can't use the track. Back to the turbotrainer. It is still cold..our indoors hall, even with a heavy sheltering curtain was 9 C this morning....so despite the inviting sunshine a walk,not a cycle, is on the cards,plus a visit to a Certain Swedish Store to stock upon picture frames . So we still have to head for Glasgow. A thaw is promised for the weekend...so it looks like anyone going will have a mudfest to watch or compete in!! The print runs are all dry now except the Pine Shelter Belt Now today's sun is streaming through the window onto the pasting table where they lie drying, they will be titled signed and numbered this morning. I might print the Green Lane block as it is, the response from others has been good for that image...then try changing it...Green Lane mark 2 ! I've hunted for picture frames locally, but even for a simple frame the price is twice as much and the quality half as much. The ones I buy are from Poland, so don't have to come halfway round the world at least. The weather is getting colder but is at least still dry. We are aiming for a short cycle ride out to get some real air in our lungs, but are wary of ice (falling off is not good..we don't bounce so well now) or getting cold and soaked by rain. The turbo trainers are set up side by side in the Pirate's study if the weather goes unfriendly, but it isn't the same. While it snows outside, I've been busy....but only during daylight hours. 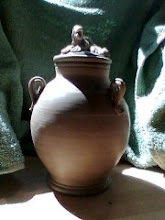 As with working in clay, natural light is the best,even when you need a top-up with electric light. I'm not happy with the last one yet...but the trees are good in it. Blogging has taken a back seat..and photography too, briefly.. The ride on mower has taken two or three hours for three afternoons so far this week. Hopefully today will see the job done , waterpump replaced and cutting bed cleaned and treated if not back on. The bed needs a few holes patching before it goes back on! That will get done when the underside has dried. I've finished the print run on the Tarbolton windswept tree print and put three prints on my Etsy shop. Its good to feel there is progress there. At least that is work I can do indoors. Outside is thoroughly wet, and we haven't had a properly dry day for a week in Ayrshire. We were fortunate in the weather on our Pitlochry trip. This morning I was tempted by the lack of rain outside..now, with two washes ready to go on the line it is raining again!! Last Saturday we left home in the rain just after 7am...and drove 130 miles to Pitlochry. There we joined my fellow team members of RT (Race Team) 23 for a ride. We went on the shortest route, just under 30 miles, out along the Southern side of Loch Tummell , cross over at Tummell Bridge and back along the sunny side . It wasn't long before most left us behind and we told those who waited to carry on...we're not as fit as we should be OR used to hills!! The others rode an extra ten miles over the shoulder of that snow topped mountain, Schiehallion..finding snow and ice on the road as well!! After a brief lunch came the AGM, and at the end the Pirate and one of our main mover and shakers were presented with life memberships of the team. Pirate is already the President,voted so by all the other riders for all he has done and still does for cycling and his fellow cyclists. In the evening we all had supper at an Italian restaurant in the town and some went on to local live music. A great night out. Llanddewi Skirrid village hall, near Abergavenny...but just like a church in NewZealand ! We were lucky to find this..our method of going for a ride when time is short,is to set the timer on my phone for half time...we just found this after the timer sang out..
We drove home on Tuesday last, and have been trying to catch upon ourselves since then. We have at least seen our two main garden customers. Both are paying by barter this time. One with a bike she hardly used, as she is now crippled with an arthritic spine. The other with a mountain of windfall apples and Japonica quinces as a relation has stolen a lot of money from him and he is also housebound. The one is too wet to mow, but I'm doing a little garden tidying and the Pirate is mending her ride on mower. The other, still too wet to do the last cut of the year, but the hedges are getting a trim..we love the garden he loved and if we keep it in trim it makes our job easier next year. On our way back to the Carpenter's home from their allotment. We travelled to South Wales yesterday, to celebrate today...Woodchip, my granddaughter and the Carpenter's daughter is one today! Unfortunately she has picked up an infection that is going round their village and has some nastily infected tonsils. Tomorrow the Pirate has a train ride under the water to go and stay the weekend with his elder daughter and family, as she is nearly 50. As we were leaving home yesterday morning our neighbour asked us why we stay in Scotland, if we have to travel so often to see friends and family. The answer? Because it is our home,where we are made welcome.It feels like home. Shelter Belt Pines isn't finished, but until the bloc has dried I can't cut further. Just what you get up to when you've newly finished vaccuming the floor! I'm not happy with this,its getting too fussy and fiddly and is losing the dark focal point in the centre. Every time I get work flowing, Life intervenes...cleaning, cooking, gardening, cycling, shopping.....next week I must get prints on Etsy. Truly wild crab apples...with vicious thorns!! It is a Forestry Commission area, with walking and cycling trails, a bike shop and a good cafe. It is one of the Seven Stanes Mountain Biking trails.